Heirloom recipes. Do you have those? Handed and taught down from generation to generation through family members? I don’t have an image of me growing up with my grandmother on one side and mother on another, dabbling with ingredients in the kitchen or making a mess with flour and sprinkles. Inay, my grandmother (mother side), was not so much a kitchen person. She’ll concoct some traditional Tagalog / Filipino dishes every now and then, effortlessly. The few times she’s in the kitchen, she can work magic with simple ingredients – from scratch. And I mean from a live chicken to a dish on the table. That type of cooking. Other than those few magic moments, she’s really a Martha-Stewart-recycling-DIY-kinda-gal. She’ll make a “walis ting-ting” – broom made of sticks from dried coconut palm leaves. She’ll idle away the time making floor rags from old fabrics and old t-shirts. She’ll clean the hell out of old coffee, jam, peanut butter jars and reuse them as drinking glasses and tumblers at home, she’ll be happily tinkering away the afternoon in her sewing machine. At the best of times, she’d be making mean "pinais na tulingan" (slow braised tuna in tamarind or kamias), tinolang manok with malunggay (native chicken tinola with moringa leaves). Her cooking was always simple with fresh ingredients and as organic as would be called now. Now my grandmother on my father's side is the all the time cook. Although I have never spent time with her side by side in the kitchen (she's lived in the US since we were born with a few visits in the Philippines while growing up), I have gotten to know her through her cooking. The few times she's visited us was always a lesson in the kitchen. And this is her recipe. One of the dishes she can throw all together in a bowl without batting an eyelash, without measurements, and it always comes out perfect. And whenever they make this at my aunt's home in NJ, everyone pitches in and make these. Now like all recipes, as long as you have the ingredients on hand it's really up to you to adjust the quantities as it suits your taste. The flavour, feel and texture is entirely up to you. I have tweaked my grandmother's recipe for the filling to suit our preferene at home. There are two elements to this recipe - the filling and the dough/pastry. In a large skillet or wok, pour about two tablespoons of vegetable oil and heat the pan. Saute the onions and garlic until soft and fragrant. Add the potatoes, carrots, capsicum, celery and cook stirring to coat all the ingredients. Add soy sauce and season with salt and pepper. Turn the heat to medium and simmer until meat and vegetables are cooked through, 10-15 minutes. Add the frozen green peas and sprinkel the chilli flakes if using. Simmer for another5 minutes then turn off heat. Spoon onto a large bowl and let it cool. 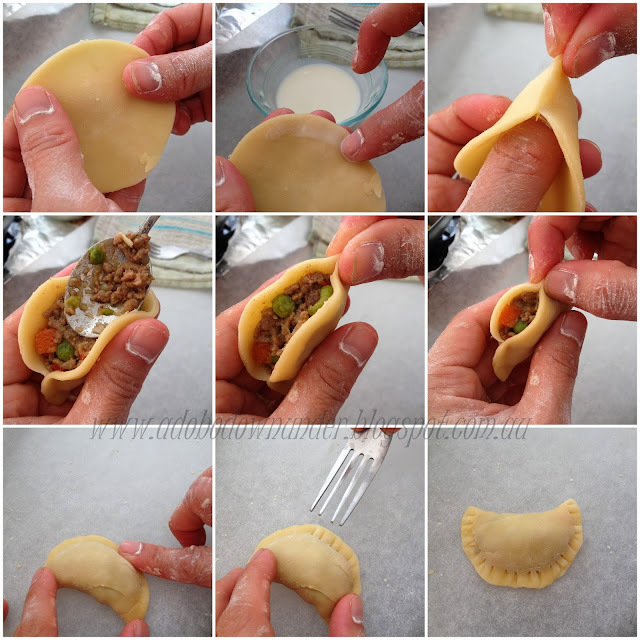 Make sure the filling is completely cool before making the empanada/empanaditas. Combine all the dry ingredients in a bowl and rub the ingredients with your hands until it resembles fine crumbs. Slowly add the water (a little at a time) and continue to mix with your hands until it forms into a ball. * Alternatively, you can process the butter, flour and sugar in a processor, then slowly pour the cold water until the mixture forms into a ball. Flatten the dough slightly and chill in the refrigerator for 10-15 minutes. Place the dough on a flat surface, and using a rolling pin flatten the dough to abou 1-2 cm thick. Cut the dough with a cookie cutter (your desired size - can be bigger or smaller). Filling the dough: (see photo below). Press on the sides of the dough to slightly thin them out. Seal one side with milk. Fill the dough with a tablespoon of the filling. Slowly pinch the sides to seal the empanada. Place on the flat surface and using your thumb/finger, press the sides of the empanada. Further seal the edges with a fork. Place all finished empanadas on a lined baking tray. Continue with the other dough/filling. Before baking, preheat oven to 180*C.
Brush the empanadas/empanaditas with egg wash.
Bake in the oven until golden, 30-40 minutes. * When making the filling, you can add other ingredients to suit your preference. You can make it entirely vegetarian too. * Alternatively, you can also deep fry the empanadas until golden, then drain on paper towels. * Create small air pockets on the empanadas prior to baking so they don't inflat too much leaving a space between the dough and the filling. I usually use a small knife or a fork to do this. * This dough which my grandmother uses does not have the flaky texture when baked. If you prefer a flaky dough, you will need to roll until thin, fold, then roll, and fold and roll. The layers from rolling and folding several times creates the layers which results in a flaky dough. * Some empanada recipes calls for lard and butter combined, which also helps in creating a flaky texture when baked. Trissalicious shares in her blog a secret for a flaky empanada. * Store-bought puff pastry can also be used to make these empanadas. * They are called empanadas when they are bigger, like the palm of one's hands. This recipe for empanaditas are bite-sized and a little fiddly to make (photos show scale). You can always adjust the size to suit your preference. From Inay Mercedes and lola/grandmother Antonia, this is my heirloom - memories of good old fashion, no-nonsence cooking. No fancy antique jewelries here, or grand estates. And this family recipe, I'll recreate a tradition at home when making this - as these are bite-sized pieces, I'll gather the girls around the table, pinch away dough and seams and filling and sharing stories and creating new memories.